If there is one term in the tech/entrepreneurship world that makes me grate my teeth (more than my TMJ already does), it’s the term “lifestyle business”. SEE? Didn’t that just make you shiver and want to punch someone at the same time? I severely dislike this term, which is often used when comparing a business to a VC-backed business. We all know my take on VC vs bootstrapping (at least for me and my business right now), so I won’t go off on THAT rant right now, but let me explain why “lifestyle business” makes me so mad. Entrepreneurship is hard. It’s a rollercoaster of epic proportions every day. There are extreme examples of people who basically come close to killing themselves, ignoring their friends and family and well-being, to found and grow a business. I do not think this is admirable nor is it a healthy lifestyle. Every entrepreneur has to dedicate themselves to their business to see it grow. You can’t say that something isn’t working after 2-4 days of data. It takes, as Jason Lemkin says, it takes 18-24 months to get initial traction. So saying that someone running a bootstrapped business isn’t dedicating their life to it is simply unfair. I think about work all the time, and when I get to a computer I have been thinking about the problem for quite a long time. I don’t run my business to sustain my lifestyle, though. Do I want or even need it to succeed so that I can live a comfortable lifestyle? Sure. Every entrepreneur needs to eat. But I’m not happy with sustaining a lifestyle. Every business, whether VC-backed, bootstrapped, franchised, or something else exists because of a need. Well, if it sticks around then there was truly a need. Businesses can change the world and the lives of those who start them and work at them. Even non-VC companies can end up with a very real financial outcome that changes the lives of the founders and the employees, not to mention the customers who are using the service to grow their own business. Businesses change lives and can change the world. Some transform entire industries while others transform a few around it. Very few businesses exist just to maintain the owner’s lifestyle. Business is hard. If you’ve never run your own business then you might not really understand what that means, but every business owner reading this is nodding their head vehemently right now. You can’t operate your business alone. I don’t care who you are; even if your business technically only has 1 fulltime person (like mine) it’s not being done alone because you have the support of family, friends, and your customers (if you are lucky enough to have customers). Most companies are bigger than just their fulltime employees though. For example, I use Bench.co for bookkeeping, 1800accountants.com for accounting, Hubspot CRM for contact management, a few WordPress contractors for help with WordPress development that is still above my knowledge level. Each of these is instrumental to the (hopefully eventual) success of Credo. Every business supports lifestyles, so calling businesses that haven’t raised money “lifestyle businesses” while those that have raised money are not simply does not ring true. I’m arguing that every business is a lifestyle business, therefore no business truly is and we should stop referring to some as being that and others as not being that. Each type of business (funded, bootstrapped, franchised) has its own challenges for the founder(s), employees, and those surrounding them. 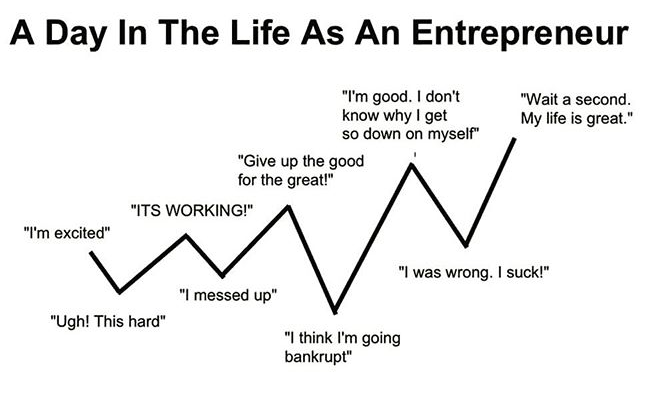 Business is hard and we all need support if we are going to survive the very real ups and down of being entrepreneurs. So let’s stop labeling things when we don’t need to. Instead let’s look at businesses for what they are – change agents – and root for all of them equally. There’s no hierarchy here – let’s respect the corner store owners as much as we respect the unicorn founders. Great post John! If we would just consider our motivations (change vs self-fulfillment alone) for the hard work, I think more of us would be able to manage the ups and downs with more fortitude. Thanks for sharing your thoughts on this! Love the graph – so true. There is a great quote which I cannot remember regarding these same roller coaster series of emotions that come with owning your own business. It is a tricky balance to work to earn enough to also enjoy life while growing your business and wanting it to be super successful. I just returned from a 38 day backpacking trip in Spain and I enjoy a lot of ‘hiking’ time during the day so I can’t say I obsessively work to grow my company to a size somebody else might – but I do take pride in doing whatever I do – very well. I don’t think I would enjoy the stress of having a VC funded company – even if the same effort was required. But that’s just my stress barrier. In my opinion, it all comes down to buzzwords. Trending key phrases that people use just to create a certain image. Half these people use the term but have no real understanding of it.